The public tries the new Aggie Ice Cream flavor for the first time. LOGAN – A new Aggie Ice Cream flavor was debuted in honor of tonight’s inauguration of Utah State University President Noelle Cockett. Students gathered on the west end of the Quad at noon to surprise the unsuspecting Cockett with the announcement. “We are proud to present a peanut butter ice cream with a fudge ribbon and chocolate covered pretzel,” she said. Each person in attendance had the chance to try the new flavor. Lieber said CAAS ambassadors and council members were asked months ago to contribute ideas for a new ice cream flavor, though they weren’t told why. Of those six flavors submitted, four were produced and sampled by the college’s ambassadors and counselors, which determined the chosen flavor. Cockett’s inauguration address will take place at 7:30 p.m. tonight at the Ellen Eccles Theatre. A reception will be held after where the public will have the opportunity to meet with Cockett and eat – you guessed it – Aggie Ice Cream. 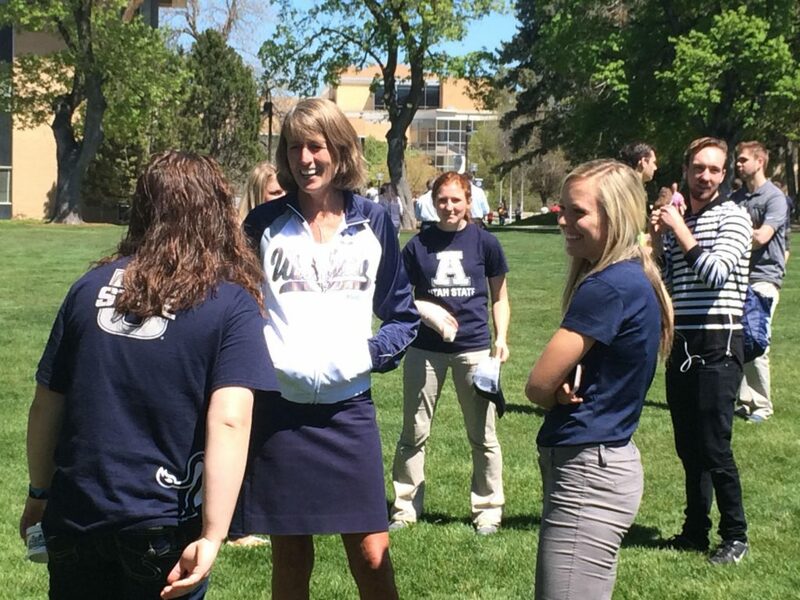 USU President Noelle Cockett (center) meets with CAAS Senator Heather Lieber (right) and another USU student on the Quad shortly after the unveiling of the new ice cream flavor.